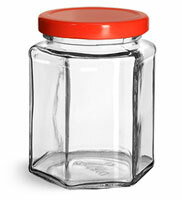 These glass hexagon jars are available with red metal lug caps. These lug caps feature plastisol liners. When heated and cooled properly a plastisol liner adheres to the rim of the glass jars creating an airtight and tamper evident seal, making these jars ideal for canning and preserving foods.